Director: Jules Bass, Arthur Rankin Jr. 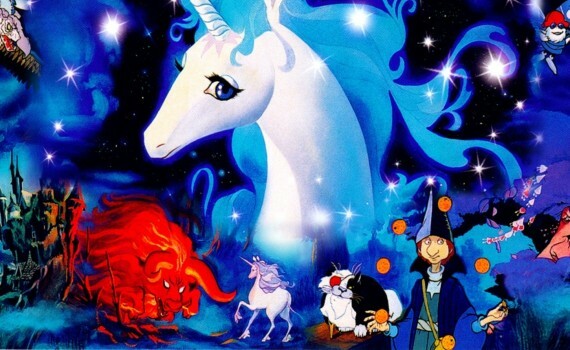 In the tradition of Raggedy Ann & Andy: A Musical Adventure and Rainbow Brite and the Star Stealer, The Last Unicorn is a trippy 70s/80s animated extravaganza that you need to have loved at a young age in order to love today. The wacky characters, the strange artwork, the dramatic songs, the David the Gnome feel; once you’ve seen the style you know what to expect, and while you may have dug it when you were seven, the same might not have been true if you had watched it when you were thirty. These epic animated adventures are odd at best, but good-hearted, and are meant to be darker versions of what Disney has been pumping out since the dawn of man. Just be ready for a nonsensical journey through a nonsensical land and you’ll be alright. The very last unicorn in the world lives protected in her home forest, while all the other unicorns mysteriously disappear. A magical red bull chases them to the end of the Earth, where they & their powers are gone forever. Who controls the bull, what purpose does it serve, and to where are the unicorns banished? These questions haunt the last unicorn, and so she begins a quest to find the answers. Along the way, she meets the bumbling amateur magician Schmendrick and the world-wise Molly Grue. Together, and after the last unicorn changes into human form, taking the name Amalthea, they seek out the villain who wants the unicorns for his own, King Haggard, and the evil red bull that is at his command. It’s one of those plots & experiences that bring LSD to mind, fair or not, and it’s funny that these weird tales have become childhood favorites. I never actually watched The Last Unicorn in my youth, so I don’t have that nostalgia connected to it, I just see it as odd. Fun in a certain way, but odd. The characters are insane, the story meanders, but the pieces come together just enough to be entertaining, even to adults. America does the soundtrack, which is cool, and the celebrity voices are pretty impressive now: Farrow, Arkin, Bridges, Robert Klein, Angela Lansbury, Christopher Lee. Those actors make the movie relevant to today, and I can accept that this film is a classic, even if I will never love it the way it was meant to be loved.